Bruce Hopping (a.k.a. “Brucey”, “Mr. B”, et al.) passed away peacefully just after midnight on Thursday, May 17. He is survived by his nephew and niece, Rick and Melissa Hopping, of New Jersey. Hopping was a local legend. He could be seen every day walking down Thalia Street to the beach where he was a regular for the last six decades. His life story reads more like a novel than reality. He was born in 1921 to W. Frank and Edith Hopping in Saigon, then a part of French Indo-China. His father had lumber interests in the region, and the family was on their way to Borneo. Bruce spent his early years on the islands of the Pacific, where he developed a lifelong connection with the ocean. At 13, he was sent away to Culver Military Academy in Indiana. At 18, he enlisted in the Army and was stationed at Ft. Riley, Kansas. Afterwards, he transferred to Shepphard Airfield Base in Texas, Westover Air Base in Massachusetts, El Toro in California, Kaneohe Naval Air Station in Hawaii, and Clark Air Base in the Philippines. In World War II, Hopping was a med-evacuation pilot who retrieved the wounded bodies of soldiers from various Pacific theaters and returned them to the base hospital for treatment. One day, he was sent up with a spotter in typhoon conditions to locate a downed C-47. Their Stinson plane was blown several miles off course, they ran out of gas, and crashed into the Pacific Ocean. For the next several weeks, they floated on a one-man raft in the ocean, enduring violent storms, tumultuous waves, and shark-infested waters, before eventually washing up on the Polillo Islands in the eastern Philippines. After a series of difficult setbacks, and with the help of locals in canoes, they eventually made it back safely to Manila, despite the presence of Japanese soldiers in the area. After World War II, Hopping taught at Bainbridge Air Base in Maryland. When the Korean War broke out a few years later, he was transferred to Barbers Point in Hawaii, and then put on a minesweeper ship bound for the Korean peninsula. After the subsequent deaths of his parents, Hopping took his inheritance and created the New Jersey Foundation in 1953. Over the next decade and a half, the New Jersey Foundation sponsored numerous important aqua-athletic events and commissioned multiple notable works of art. Inspired by visits he had made to Laguna Beach in 1942 while stationed at nearby El Toro, Hopping relocated to Laguna around 1960. In 1966, he met Dr. Ted Brunner, another Laguna Beach resident, and founder of the classics department at UC Irvine. Dr. Brunner introduced Bruce to the ancient Greek educational concept of kalos kagathos, a phrase used by classical Greek writers to describe an ideal of personal conduct which emphasizes physical distinction and nobility of mind. Inspired by the concept, Hopping renamed his foundation the Kalos Kagathos Foundation in 1968. For 50 years, Hopping and his foundation have been recognized for numerous contributions to water sports, arts, and the environment. His cultural exchanges for swim, surf, and water-polo teams have included multiple events on every continent except Antarctica. He is an emeritus patron of the International Swimming Hall of Fame, patron of the Amateur Athletic Union, the international swimming federation FINA, International Studies Abroad, California Interscholastic Federation, and Orange Coast College Rowing, and a two-time Olympic swimming judge. He has been formally acknowledged by various officials, governors, ambassadors, diplomats, provincial administrators, tribal chiefs, warrior clans, and others. Since 1968, Hopping also has worked tirelessly through the Kalos Kagathos Foundation to ensure that Laguna Beach retains its historical legacy as an international destination promoting water sports, arts, and the environment. His local contributions are too numerous to mention, but include multiple proclamations by the City Council and school board. Very few Laguna Beach residents have left such a lasting indelible impression on this city, and nobody as much on Thalia Street Beach as Bruce Hopping. Please join us for a celebration of his life at 4 p.m. Thursday, June 14, at Thalia Street Beach for a paddle-out and swim. Info on foundation is available at Kalos Kagathos Foundation, PO Box 416, Laguna Beach, CA 92652, or [email protected]. The author is a representative of the Kalos Kagathos Foundation. Laguna will miss you, along with many many friends. Bruce. 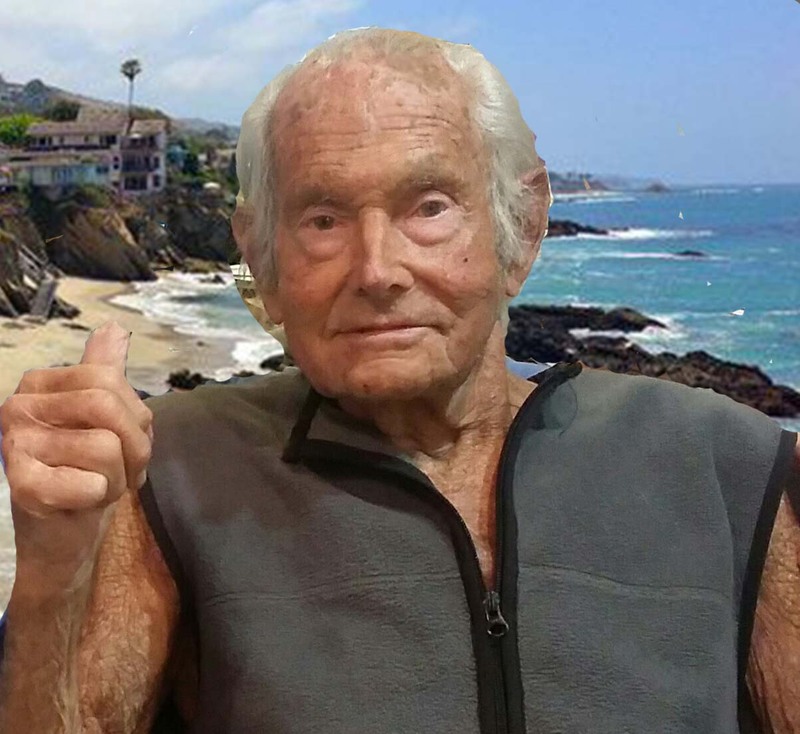 You are an inspiration to all who had the good fortune to know you and an institution in Laguna Beach……. Bruce was a great friend to me, especially in my teenage years as a Thalia St. grom. He helped me buy my first car, and took me and other water polo team mates on an unforgettable adventure to Micronesia. My heart sank when reading this news. He will live on in my memories and the endless stories he use to tell. In a world where conformity has mushroomed into a safety zone for much of American society, Bruce was his own man. Unprogrammable. Absolutely, unique, generous, energetic and probably never saw a doctor more than a few times in his life. His diet was impeccable as was his lifestyle. I grew up as his neighbor and always admired Bruce. In 1963 when I was soon to turn 13, I asked Bruce in what year he was born—my father wanted me to use Bruce or Jim Henderson as a surrogate father of a soon-to-be teenager. Bruce said that he was born in 1914, one year after my father. My memory is perfect on this one. So perhaps it’s the case that Bruce was even more amazing a person than we’d imagine. With no uncertainty, the extraordinary soul who played his part on the human stage as “Bruce Hopping” is off to better and grander horizons.